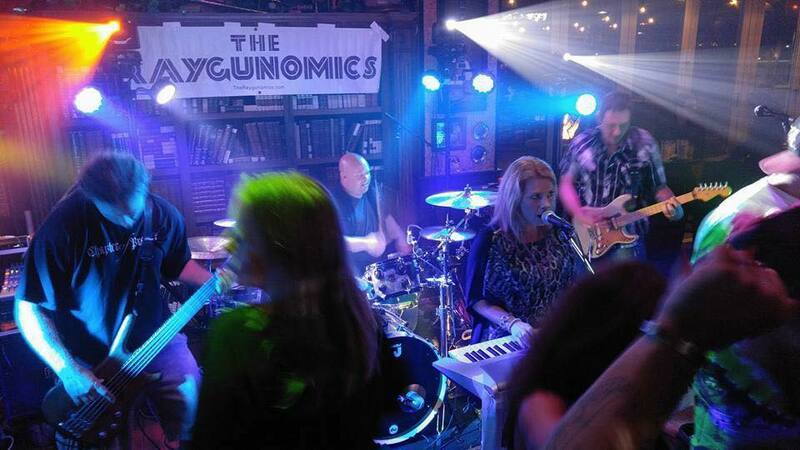 The Raygunomics were formed in August of 2008 to bring a new voice to great 80′s-era music (and now going beyond the 80′s!!!). The members bring a TON of original band experience to the group, as well as the professionalism and work-ethic of a veteran project. Their goal is to play and entertain, sharing a love for all the popular music they listened to (and were influenced by) growing up, including all of your favorites as well as those “rare gems” the retro radio shows and DJs seem to forget! Keny Karnisky comes from the great land of upstate New York. He has been playing guitar for… a real long time and started in music on saxophone in third grade. He comes to the Raygunomics after many years in the Denver music scene, hailing from such self fronted bands as Blind Harvest, Rider Beware, and Quillion. Keny is a family man who enjoys nothing more (and nothing less) than family time, hot sauce, beer, and shredding guitars. On lead vocals and keys we are lucky to have Miss Amanda Ray! Amanda has been performing professionally since childhood. She now calls Colorado her home after moving to Denver from Baton Rouge, Louisiana. She currently sings and plays keyboards for several local bands, most notably, QUILLION. She may also be found singing the National Anthem for the Colorado Avalanche, Colorado Mammoth, Colorado Rapids, Colorado Rockies, Colorado Eagles, and many service organizations. Next up, our bassist, Mr. Tim Hankinson! Tim started on guitar when he was 15, as his Dad helped buy him a guitar in an attempt to get Tim away from video games. Once Tim picked up the guitar he spent hours and hours in his room learning songs every day. A few years later an uncle, who was a major influence to Tim with music since he had been playing in bands when Tim was growing up, needed a bassist and offered him the gig if he could quickly pick up bass. So Tim went and bought a cheap bass and amp just to get into his first band. Once he started learning songs from bands like Primus and Tool he was hooked on the bass and it became his main instrument, and Tim’s been slappin’ da bass ever since!